Alas, I did not go into labor, so we kept our scheduled appointment for an induction on the 30th. When I arrived, they had some trouble finding the heartbeat, because he had turned around again! He had been transverse breech, but had turned head-down, as recently as the 28th. After a quick sonogram, I was told that I would need a C-section. We scheduled that for 2 hours later and I waited. I was relieved that the birth process would be easier for Aaron, but scared of the additional recovery time that a C-section would mean for me. I was quite dramatic with myself as I sat on the operating table getting my spinal block! I imagined sprinting from the room; I argued with myself about what I was and was not going to do, but in the end, I had a C-section with no medical complications. 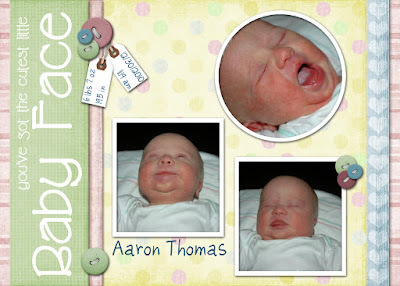 Aaron had the cord wrapped around his neck twice, so the C-section DID turn out to be the best route! Recovering from a C-section isn't quite as bad as I thought it would be, but I certainly don't recommend that you go getting one on an elective basis just for fun! LOL I was able to come home on January﻿ 1st and have really enjoyed the painkillers that were prescribed! On December 31st, while I was still in the hospital, I had a visit from the staff pediatrician. I expected him to say "everything is normal - he looks great!" I was shocked to hear "We think that your son may have Down's Syndrome." Over the last week I have learned quite a lot about Down's Syndrome, and today the genetic karyotyping test results came back positive - we are officially the parents of a Down's Syndrome child. I have such mixed feelings. I am certain that I love this child irrevocably! I am certain that I am proud to be his mother. I am certain that I will do my best to provide for his needs to the best of my ability, as I do for all my children. I am uncertain as to why I cannot stop crying! I will let you in on a secret: I'm not as strong as everyone thinks I am. I just tend to process things first so that I can put on a brave facade. I'm not even strong enough to do this now though. I have decided to process publicly ;) I haven't cried like this since we lost Ian. These are sobs of grief. Hot, bitter tears and convulsions that cause nausea and shortened breath. My eyes are so puffy and swollen that my husband made me take a Benadryl, just in case it was an allergic reaction to the mysterious bug that bit me while I was in the shower, crying. The only discernable difference (right now) is that this is not grief over death. This is grief over life. A changed life, a life different than I imagined or planned. A life of potential hardship and judgement for my beloved child. A life of learning and challenges for me; for my children; for my extended family. I have a strange duplicitous conversation that goes around in my head. I am not sure that I can even give it adequate description. One part of me says that it would have been better to not have gotten pregnant, that his life would have been better not even existing (I know that sounds terrible, but I'm being honest here). Another part responds that I wish I had just known sooner, so that I could have better prepared. Another part scolds that part for being so foolish as to think that finding out while still pregnant would have been better! And that's the conversation that I'm willing to share. Last night we told our parents and our daughter. Of course everyone said that he was just extra special and it doesn't change how they feel about him. Our daughter is only 9, so she doesn't really understand all that it means. I am looking forward with mixed feelings to the return of our other boys. They've been at my mother-in-law's home for several weeks while William and I recouperated. The oldest is 12, and I won't publish this or make Aaron's diagnosis public until I've told him, but I want to do it in person. He does know a bit more about DS, and even more about how cruel people can be, especially kids, to those who are different. In addition to the constant headache I've had ever since delivery, I've been sick today with intestinal pain and all that goes along with it (I'll spare you the details!) I'm pretty sure that I made myself sick with worry yesterday. I did hear back from a friend that I've reconnected with on Facebook. She has a 12 year old son with Down's Syndrome. I reached out to her for direction and she replied immediately with her phone numbers and an assurance that she was willing to share anything with me. She didn't say "I'm sorry", I think she's the first one. I'm not quite sure how to resond to that, even though I've been dealing with it for 4 years. That's the standard response to losing a child too. It doesn't quite fit, but it does seem a little more apporpriate when you're talking about death. When you are talking about a living, and otherwise healthy, child - it just is a disconnect. Perhaps I'm wrapped up in semantics, but there has to be a better response. If you can think of one, let me know! I sure can't. Aaron has started being much more vocal today, much more insistant about feeding time. It's good to hear him being more alert, but I had gotten used to his quiet demeanor. He's staying awake longer in the daytime too, and I was actually able to get some sleep last night. I feel like I should chart his times so that I can get a visual picture of where we are and see the progress, but I'm just too tired. Maybe tomorrow. I've been doing really well the last few days. I've learned a lot about DS, the pediatrician told us that his muscle tone is really good for a DS baby, and we are very hopeful that all of his DS symptoms will be mild. I'm really tired of being strong, and even more tired of practicing what I preach (can I get a witness? LOL) Going through tough times and facing unexpected challenges really shapes each of us. I know this, but there are still days that I want to just run away or at least go back to bed. Anyway - I'll keep on putting one foot in front of the other and taking it one day at a time, and all that jazz. Aaron is a huge blessing, he is so sweet and cuddly. This is not a burden to bear, it is simply another path for my life. Aaron Thomas joined us on December 30th. He was delivered via C-section due to being breech. We later discovered that the cord was wrapped around his neck twice! Needless to say, my recovery will belonger than anticipated, and I'll probably be pretty quiet on the blog!